Juneau, Alaska is home to Alaska’s most celebrated lodging experience. Pearson’s Pond Luxury Inn and Adventure Spa is Alaska’s only AAA Four Diamond Award winning hotel/resort. Enjoy privacy, hospitality and exceptional amenities at a superb value. You have found the perfect destination for adventure, romance, wedding & business in Juneau, Alaska. Experience serenity in a rain forest garden and casually elegant surroundings at Pearson’s Pond Luxury Inn and Adventure Spa in Juneau, AK. Nestled alongside a glacial kettle pond, our award-winning accommodations are more like those in a boutique hotel than a typical bed and breakfast. Pearson’s Pond is a frequent winner of Trip Advisor’s Certificates of Excellence and is consistently rated by our guests as the best place to stay of all Juneau, Alaska’s hotels, bed and breakfasts and inns. Our quality and service are unparalleled and our unique amenities make your Alaska travels even more memorable. In addition to a sumptuous summer breakfast and evening hospitality hour; we provide complimentary bikes, boats on the pond, BBQs, fishing equipment and more. We are here to help you learn about Juneau trails and other things to do in the area. We will even arrange your excursions for you (visit Alaska Adventures Juneau to learn more about things to do in Juneau). Our tastefully appointed guest rooms, lobby, dining room and top-notch hospitality combine to make you feel both at home and pampered. Our #1 goal is to help you have the best Alaska experience possible. All guest rooms have eco-friendly fireplaces, kitchenettes, sitting areas and beautiful views. Some rooms also have two-person whirlpool tubs and balconies overlooking the pond. Our “Best Price Guarantee” ensures that we will meet or beat any rate offered by an online travel agency and we often have specials that are not available through any other channel. You will experience immediate tranquility in our magical, master-planned garden that has been featured in Sunset magazine and incorporates several water features, gazebos, a sauna and two hot tubs. This is a wonderfully serene spot to read a book, sketch wildlife or relax with a glass of wine. We welcome families and are also a well-known romantic traveler destination. Enjoy a glass of wine in an outdoor hot tub, relax together in front of your fireplace. With our romance packages you can arrive to candles, rose petals and soft music. You can add champagne, chocolates, flowers and more – whatever it takes to make your honeymoon or romantic retreat memorable and exciting. 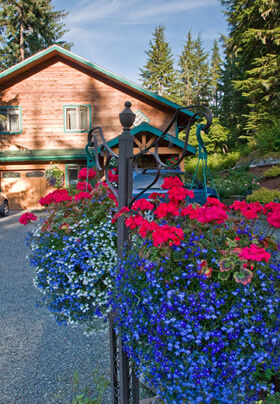 Pearson’s Pond is only Juneau hotel or Bed and Breakfast to offer on-site massage and relaxation services. At our wellness spa you will relieve your tension and ease muscle aches after a day of hiking, biking or kayaking. We are the only Juneau hotel offering a wide array of massage and relaxation therapy treatments. We are also Alaska destination wedding and vow renewal specialists with venues galore including glacier weddings, wilderness weddings, whale watch weddings, and more. We are Alaska experts and provide comprehensive and knowledgeable information, coordination and reservations assistance for your complete Juneau and all-Alaska travel and wedding planning needs. Pearson’s Pond Luxury Inn and Adventure Spa is here to serve you and we look forward to helping you make your Alaska experience the best that it can be.